Indie Retro News: That Sinking Feeling - Paul Weller's first ZX Spectrum game gets a release! That Sinking Feeling - Paul Weller's first ZX Spectrum game gets a release! We nearly missed out on this one but not any more, as Solaris104 contacted us to tell us that Paul Weller's new ZX Spectrum game of ' That Sinking Feeling ' which was developed using Arcade Game Designer by Jonathan Cauldwell and additional music by Grigoriy Klimenko is available to play right now! 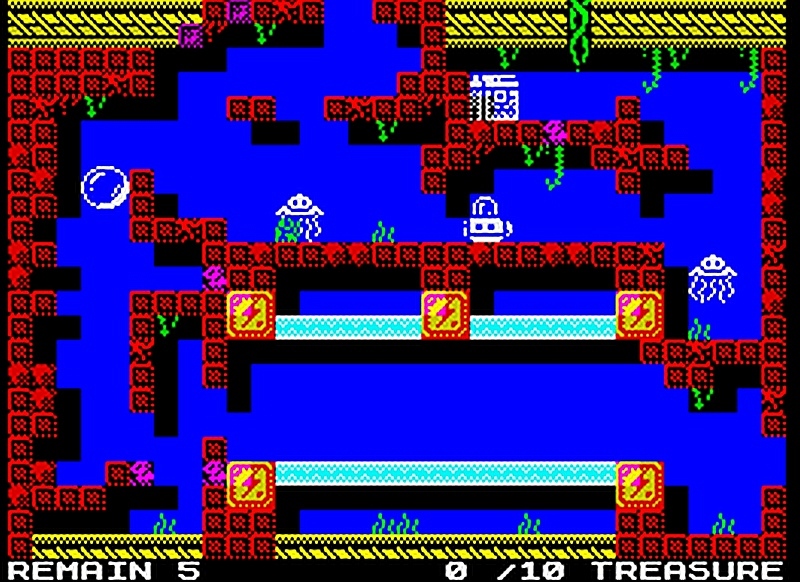 If you love your watery speccy games then give this a try, as after learning about the lost treasures deep in the depths of Atlantis, you must explore deep underwater ruins looking for treasures, while also avoiding viscous creatures, toxic fumes and dangerous free-floating mines left over from the old war. That Sinking Feeling is another great ZX Spectrum game that has appeared this year amongst many others that have taken centre stage on our website. You'll be traversing many new areas, while also being as skillful as possible to avoid some of the deadliest underwater species you could come across; Which includes nasty jellyfish, oxygen blocking bubbles, mines and even poisonous gas pumping clams. But remember the end goal is to collect all the treasure, find the warp bubble and get out of there, because if you don't, you'll end up lost forever.